Not only has Windows 7 changed its photo viewing and organizing features, it has also changed the way you import images from a camera. 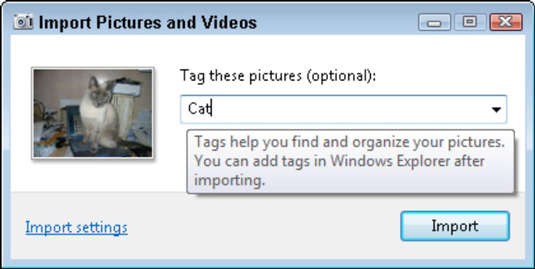 Now when you transfer images from your camera, Windows asks you to take the opportunity to go ahead and add the tagging information. Most digital cameras come with software for transferring images to your PC. However, in most cases, you’re better off using Windows 7’s built-in software, which is able to easily fetch photos from nearly any make and model of digital camera. Plug the camera’s cable into your computer. Most cameras come with two cables: One that plugs into your TV set for viewing, and another that plugs into your PC. Plug the small end into your camera, and the larger end into your computer’s USB port. Transferring the images from your camera with a memory card reader speeds up the process. When you slide your card into the reader and hook it up to your PC, Windows 7 will run through the same steps as below and do it faster. Turn on your camera (if it’s not already turned on) and wait for Windows 7 to recognize it. 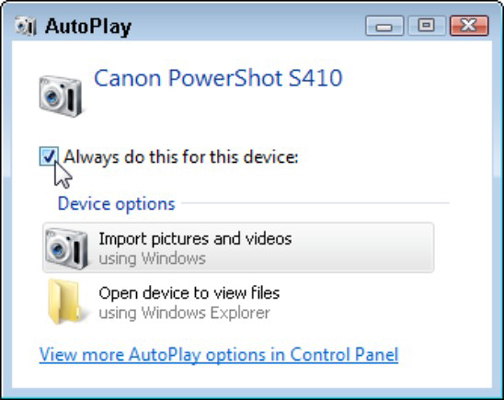 When Windows 7 recognizes your camera, the AutoPlay window appears. If you’re plugging in the camera for the first time, Windows 7 sometimes heralds the camera’s presence by listing its model number in a pop-up window above your taskbar by the clock. If Windows 7 doesn’t recognize your camera, make sure that the camera is set to display mode — the one that lets you view your photos on the camera’s viewfinder. If you still have problems, unplug the cable from your PC, wait a few seconds, then plug it back in. Don’t see the AutoPlay window? Open Computer from the Start menu and double-clicking your camera icon. In the AutoPlay window, click the Import Pictures and Videos Using Windows option. After you click the Import Pictures and Videos Using Windows option, the Import Pictures and Videos box appears. If you want, also select the Always Do This for This Device check box. It tells Windows 7 to automatically grab your camera’s pictures whenever you connect it to your PC. Type a tag or name for your photos and click the Import button. Tagging works best when all your photos come from one session. Clicking the Import button brings your camera’s photos into your PC and automatically renames them. Type a word or two to describe the photos. For example, if you type the word Cat, Windows 7 names the incoming photos as Cat 001, Cat 002, Cat 003, and so on. Later, you can use your Start menu’s Search box to find all the pictures with a given tag. Clicking the Import Settings link in the bottom left corner lets you change how Windows 7 imports your photos. Select the Erase After Importing check box. 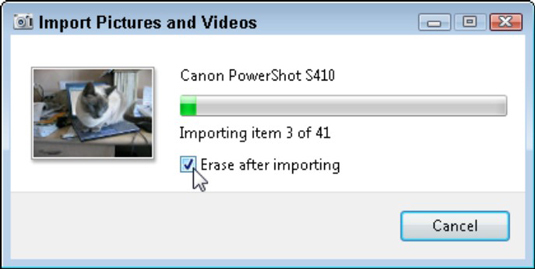 Select the Erase After Importing check box to free up your camera for more photos. When Windows finishes importing your photos, it displays the folder containing your new pictures.